Photograph and drawing of Postopsyllidium emilyae, from Grimaldi & Engel (2005). Forewing length 1.5 mm. Contains: Capsidae, Sternorrhyncha, Heteropteroidea, Fulgoromorpha, Cicadomorpha. The Hemiptera, commonly known as bugs, are a major group of insects characterised by the possession of a sucking beak. The earliest hemipterans, the Archescytinidae, are known from the early Permian to the Triassic; members of this group had a long, thin and coiled ovipositor held underneath the abdomen that may have been used to insert eggs into plants (Grimaldi & Engel 2005). Members of more derived groups are known from the Late Permian, indicating that the major lineages of the Sternorrhyncha, Auchenorrhyncha and Heteropteroidea had diverged by that point (Shcherbakov & Popov 2002). Earlier authors divided the Hemiptera between the suborders Heteroptera, with forewings often divided between a leathery corium and distal membrane, and Homoptera, with undivided wings. The 'Homoptera' are now recognised as paraphyletic, and are instead divided between the Sternorrhyncha, Auchenorrhyncha and Coleorrhyncha. The Protopsyllidiidae are an extinct family of plant-sucking bugs known from the late Permian to the mid-Cretaceous; they are related to the Sternorrhyncha by their possession of a strongly opisthognathous rostrum and wings lacking a vannal fold, but they differed in retaining three-segmented tarsi and ten-segmented antennae (Grimaldi & Engel 2005). 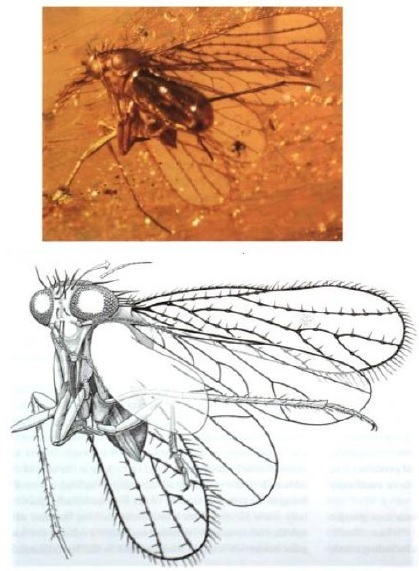 Synapomorphies (from Grimaldi & Engel 2005): Maxillary and labial palps lost; mouthparts developed into suctorial beak, with two pairs of mandibular and maxillary stylets lying in long grooved labium. [ACW01] Aguilar, H., C. C. Childers & W. C. Welbourn. 2001. Relative abundance and seasonal occurrence of mites in the family Tydeidae on citrus in Florida. In Acarology: Proceedings of the 10th International Congress (R. B. Halliday, D. E. Walter, H. C. Proctor, R. A. Norton & M. J. Colloff, eds) pp. 376-380. CSIRO Publishing: Melbourne. [A-G91] Al-Gboory, J. I. 1991. Biology of oriental citrus mite, Eutetranychus orientalis (Klein) on different citrus species. In Dusbábek, F. & V. Bukva (eds) Modern Acarology: Proceedings of the VIII International Congress of Acarology, held in České Budĕjovice, Czechoslovakia, 6–11 August 1990 vol. 2 pp. 607-611. SPB Academic Publishing: The Hague. [B83] Bolton, B. 1983. The Afrotropical dacetine ants (Formicidae). Bulletin of the British Museum (Natural History): Entomology series 46 (4): 267-416. [BMW13] Buckman, R. S., L. A. Mound & M. F. Whiting. 2013. Phylogeny of thrips (Insecta: Thysanoptera) based on five molecular loci. Systematic Entomology 38: 123-133. [BR07] Buzatto, B. A., G. S. Requena, E. G. Martins & G. Machado. 2007. Effects of maternal care on the lifetime reproductive success of females in a Neotropical harvestman. Journal of Animal Ecology 76 (5): 937-945. [C92] Crawford, R. L. 1992. Catalogue of the genera and type species of the harvestman superfamily Phalangioidea (Arachnida). Burke Museum Contributions in Anthropology and Natural History 8: 1-60. [EH09] Edward, K. L. & M. S. Harvey. 2009. A new species of Ischnothyreus (Araneae: Oonopidae) from monsoon rainforest of northern Australia. Records of the Western Australian Museum 25 (3): 287-293. [FM08] Fletcher, M. J., & M. L. Moir. 2008. Gunawardenea, a new genus of squat leafhoppers from Western Australia, with description of two new species (Hemiptera: Cicadellidae: Deltocephalinae). Records of the Western Australian Museum 24 (4): 429-436. [H05] Harris, A. C. 2005. An unusual 11-celled nest of Sphictostethus nitidus (Fabricus) (Hymenoptera: Pompilidae: Pepsinae). Weta 29: 24-26. [H97] Hicks, B. J. 1997. Food webs in forest and pasture streams in the Waikato region, New Zealand: A study based on analyses of stable isotopes of carbon and nitrogen, and fish gut contents. New Zealand Journal of Freshwater and Marine Research 31: 651-664. [Hok91] Hokkanen, H. M. T. 1991. Trap cropping in pest management. Annual Review of Entomology 36: 119-138. [How91] Howarth, F. G. 1991. Environmental impacts of classical biological control. Annual Review of Entomology 36: 485-509. [K09] Köhler, G. 2009. Heuschrecken (Saltatoria) und Ohrwürmner (Dermaptera) im Immissionsgebiet des Düngemittelwerkes Steudnitz/Thüringen—eine Langzeitstudie (1978–2001). Mauritiana 20 (3): 601-646. [K03] Kury, A. B. 2003. A new species of Pherania Strand, 1942 from southern Brazil (Arachnida: Opiliones: Gonyleptidae). Zootaxa 363: 1-8. [KA-Z11] Kury, A. B. & M. A. Alonso-Zarazaga. 2011. Addenda and corrigenda to the "Annotated catalogue of the Laniatores of the New World (Arachnida, Opiliones)". Zootaxa 3034: 47-68. [KO06] Kury, A. B., & V. G. D. Orrico. 2006. A new species of Lacronia Strand, 1942 from the highlands of Rio de Janeiro (Opiliones, Gonyleptidae, Pachylinae). Revista Ibérica de Aracnología 13: 147-153. [M07] Machado, G. 2007. Maternal or paternal egg guarding? Revisiting parental care in triaenonychid harvestmen (Opiliones). Journal of Arachnology 35: 202-204. [SP02] Shcherbakov, D. E., & Yu. A. Popov. 2002. Superorder Cimicidea Laicharting, 1781: Order Hemiptera Linné, 1758. The bugs, cicadas, plantlice, scale insects, etc. [=Cimicida Laicharting, 1781, =Homoptera Leach, 1815 + Heteroptera Latreille, 1810). In History of Insects (A. P. Rasnitsyn & D. L. J. Quicke, eds) pp. 143-157. Kluwer Academic Publishers: Dordrecht. [TJ06] Thomas, E. J., & J. John. 2006. Diatoms and macroinvertebrates as biomonitors of mine-lakes in Collie, Western Australia. Journal of the Royal Society of Western Australia 89 (3): 109-117. [WS01] Wilson, L. J., & V. O. Sadras. 2001. Host plant resistance in cotton to spider mites. In Acarology: Proceedings of the 10th International Congress (R. B. Halliday, D. E. Walter, H. C. Proctor, R. A. Norton & M. J. Colloff, eds) pp. 314-327. CSIRO Publishing: Melbourne. [W91] Wunderle, I. 1991. Life-histories and notes on the behaviour of tree-living oribatid mites. In Dusbábek, F. & V. Bukva (eds) Modern Acarology: Proceedings of the VIII International Congress of Acarology, held in České Budĕjovice, Czechoslovakia, 6–11 August 1990 vol. 2 pp. 529-535. SPB Academic Publishing: The Hague. [ZBH03] Zhou, Z., P. M. Barrett & J. Hilton. 2003. An exceptionally preserved Lower Cretaceous ecosystem. Nature 421: 807-814.